This is THE recipe I cannot get enough from! 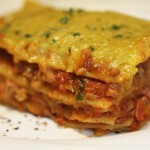 My personal lasagna record is four in one week … so not too much ;). Garfield would be very happy to be my cat! I use to cook and eat these on holidays and I usually take my lasagna baking dish along with me – yes, that’s weird! But I need to take my food and pans with me anyway (so many food and metal allergies 🙁 ) just in case, so it’s probably not the weirdest thing I take along with me. The first time I made this recipe, it wasn’t gluten-free and I am very very happy now that I have found vegan, gluten-free lasagna noodles. Did you know: July 29th is National Lasagna Day. 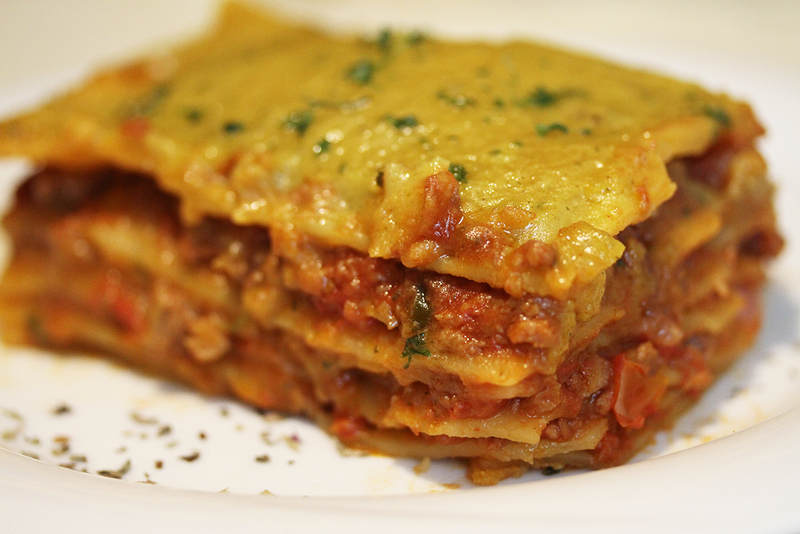 The name lasagna or lasagne is either derived form the Greek word ‘laganon’, used to describe a flat sheet of dough sliced into strips or from the Greek word ‘lasana’ or ‘lasanon’ meaning ‘chamber pot’, i.e. the dish in which lasagne is made. Soak the soya granules in the hot vegetable stock for about 5 minutes. Heat oil in a large sauté pan and sweat onions and garlic. Add the soaked soya granules and brown it for a few minutes. Add red wine and stir gently. Add the tomatoes and cook on medium heat for about 30 minutes. Add salt, pepper and chili to taste. Melt margarine in a skillet over low heat. Stirring constantly, add milk and broth to the margarine mix and bring sauce to a boil. Add salt, pepper, nutmeg and lemon juice to taste. Spread a little of the béchamel (about 3-5 Tbsp) in the bottom of a large baking dish. Layer with lasagna sheets so that the base is covered. Spread some of the filling mixture over it and layer with lasagna sheets.